First off, no I'm not kidding. The Cape Eleuthera Institute has a Bonefish Flat's group that is conducting research on bonefish habitat. Must be a cool group, right? I came across this blog posting today sharing the good work that is going on at Cape Eleuthera. 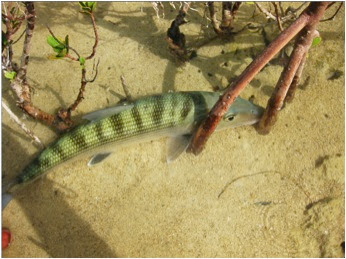 The students are studying bonefish habitat and how climate change will effect bonefish in the future. I never get tired of looking at bonefish. Courtesy of Cape Eleuthera Institute. I got to know the head of the Cape Eleuthera institute, Aaron Shultz, on my trip to Long Island, Bahamas. We roomed together a few nights and had some really fantastic discussions about bonefishing, conservation, and barefoot wading for bonefish. More on Cape Eleuthera coming soon.